Rheumatoid arthritis (RA) is an autoimmune disease that causes the body to mistakenly attack itself. It destroys healthy tissues in the joints and in other part of the body. About 1.5 million Americans have RA. Why the body decides to attack itself is fundamentally unknown. However, researchers suggest a combination of factors (heredity, hormones and viruses) might trigger the immune system to attack its own body. RA can occur at any age but it usually affects people between 30 and 60 years of age. The incidence of RA is more prevalent in women than men. Smoking and a family history of RA puts you more at risk for this disease. 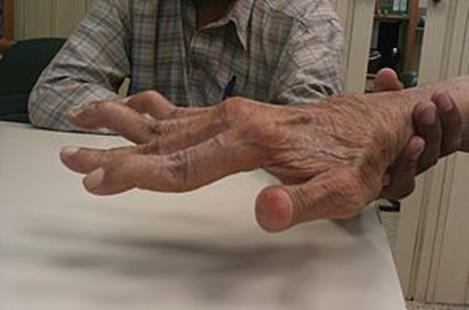 Early RA initially tends to affect the smaller joints of the hands or feet. Often the first symptoms are swollen, stiff and painful joints to varying degree. The joints may feel warm and the symptoms appear on both sides of the body (e.g. both hands, feet or knee joints). People complain of stiffness in the morning that might last for an hour. Most of the time, the joint symptoms evolve gradually over several years. At other times, patients experience a more rapid onset of symptoms. The intensity of the symptoms varies from person to person. Some individual experience increase pain and swelling called flares; others go into remission, periods of time with relatively little arthritic complaints. Uncontrolled inflammation causes the cartilage between the joints to break down and wear away. When bone rubs against bone, what follows is bone erosion and bouts of swelling, stiffness and pain. There is no single test to diagnose rheumatoid arthritis. Your doctor will review your symptoms and his findings and might refer you to a rheumatologist, a specialist with training to treat and diagnose RA. The doctor will order blood tests and among the most helpful tests will be X-rays of the joints. If there is fluid in the joint, she might remove it for analysis to better understand the possible causes for your pain. It’s best to diagnose RA as soon as possible, so that treatment can be initiated to slow down or stop the disease from damaging the joints. If you notice swelling of the joints that last more than 2 weeks, consult your physician. The first goal of treatment is to stop the pain, swelling and stiffness. The aims are to reduce inflammation and put the disease in remission. The earlier the treatment is started, the better the odds of drugs preventing joint damage and preserving function. Different medications have been used successfully to treat pain and other symptoms. Splints can protect the affected areas. Physical therapy can help increase the movement and strength of joints. Knee and hip surgery have been effective in relieving pain and restoring function. There are lifestyle changes you can do to reduce pain and prevent joint stiffness. Find a support group to help you manage RA. Work with your doctor to understand why and how to take the medications for this disease. Consult your physical therapist in ways to reduce stress on your joints and an appropriate exercise program. Use assistive devices such as canes, walkers, grabbers which let you extend your reach. Lose weight if you’re overweight. There are more than 100 types of arthritis and presently there is no cure for RA. The earlier the diagnosis and treatment, the better are the long term results. The irony is that RA immune’s system instead of protecting the body, it inflects pain and misery. Much has been achieved but more work needs to be done to remedy this disease. Early management is key!